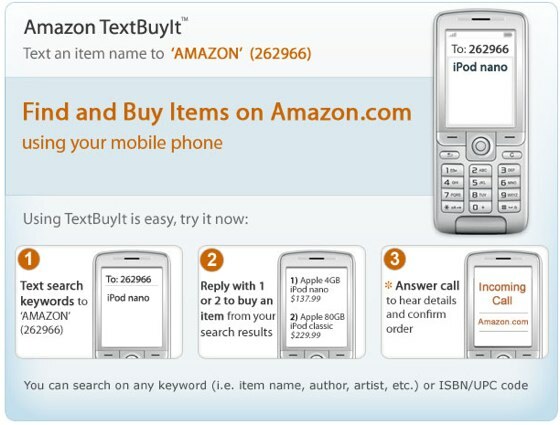 Amazon has launched Amazon TextBuyIt, a service that allows Amazon customers to purchase items via mobile phone text message. To use the service, customers text the name of a product, its description, or its UPC or ISBN number to Amazon (262966). If Amazon stocks the item, the user will get the first two results sent to them. To purchase am item, users reply with 1 or 2 and are prompted for their email address and zip code. The service then calls the user and completes the checkout process using an automated voice system. Like regular Amazon orders, users can later track the item from Amazon.com. The service is free to use, however items that are available as “Deal of the Day” or have a “Gold Box Discount” will not be discounted when purchased through Amazon TextBuyIt. The obvious application for the service is price comparisons from within a physical store; customers in Borders for example could SMS a book title to see whether Amazon stocks it for less. Expect to see people texting Amazon from a store near you in the coming months.